I never know quite what I will see when I walk around my neighborhood. It's been almost too hot to walk these past few weeks, with temperatures ranging from high eighties to triple digits, and it's still hot as the sun is going down. 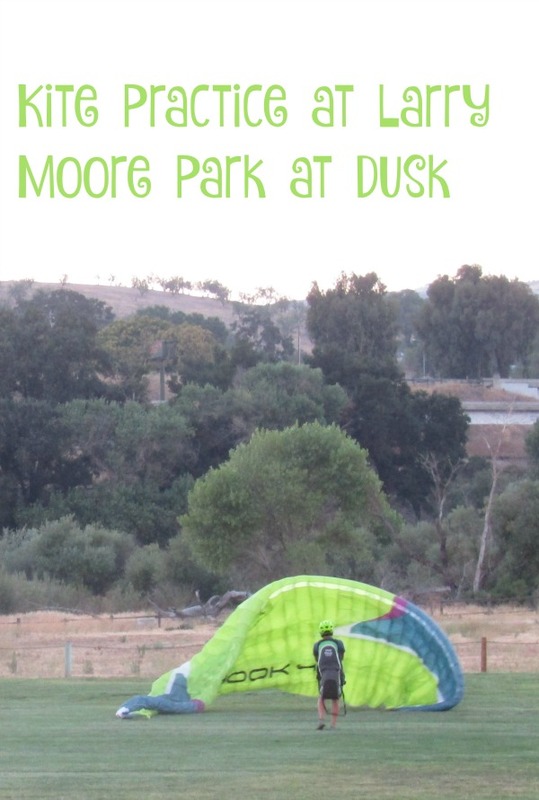 Last night, though, it was a bit cooler and I finally walked past Larry Moore Park at dusk. I sure didn't expect to see a man learning to fly a parafoil kite. Frankly, I'm no expert on kites. I wasn't sure what I was seeing. I stood and watched for several minutes as this young man made several attempts to get his kite into the air as you see above -- and below in the video. I'm no expert on kites. I wasn't sure if this was a stunt kite or a surfing kite or what made it special. I did figure out that it was a multi string kite, but I couldn't see in the dim light from a distance how many controls it had. I thought maybe this man was planning to go windsurfing, but my quick research shows he could have wanted to have the kite drag him along the ground or beach sand. It did appear to me that he was learning to fly the kite or practicing with it. The Chinese invented kites a few centuries before the birth of Christ. They were used mostly by the military at first, to measure distances. Most of them were shaped like birds. Marco Polo saw manned kites in the city of Weifang in 1282. When he returned to Italy, he brought along a kite, thus introducing kites to Europe. Now the Weifang International Kite Festival is held in that city in April of each year. People come from all over the world to watch or participate in the kite competitions at the festival. Chinese kites today may be in the shapes of animals or Zodiac figures. Some, like this flying saucer kite below, may even have LED lights for night flying. When I was young about sixty years ago, the only kites I knew about were simple ones with only one string. 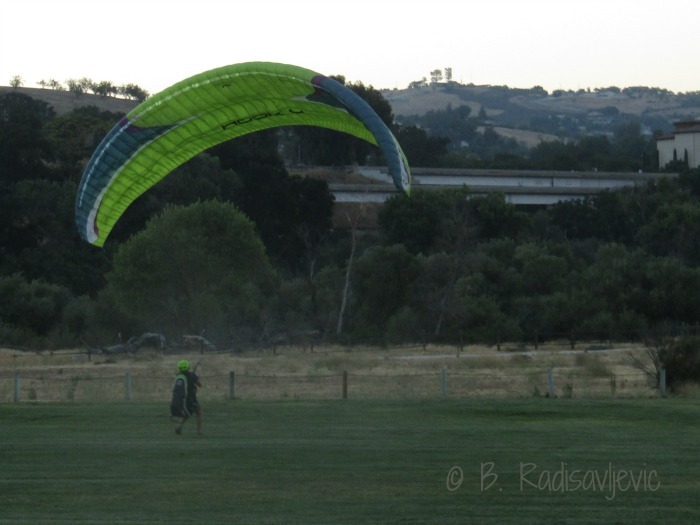 I saw someone flying that kind not long ago in City Park in downtown Paso Robles. That's the kind I and my friends attempted to get off the ground and into the air. My friends were more successful than I was. I didn't know about stunt kites until I saw a family flying them at Moonstone Beach in Cambria. I was fascinated as I saw my first kites with more than one string, chasing each other in the air. And yesterday I saw my first parafoil kite up close. One just never knows what one will find in the park. What's Your Experience with Kites? Have you flown a stunt or dual string kite? Have you any experience with parafoil kites? Have you ever been kitesurfing? I'd love to hear about your experience with kites of any kind. Feel free to share in the comments. Please pin this post so others can learn something new about kites. The City Daily Photo Blogger Theme for August is Music. Paso Robles is full of free music all over town. My favorite place to get my music fix is at Studios on the Park. 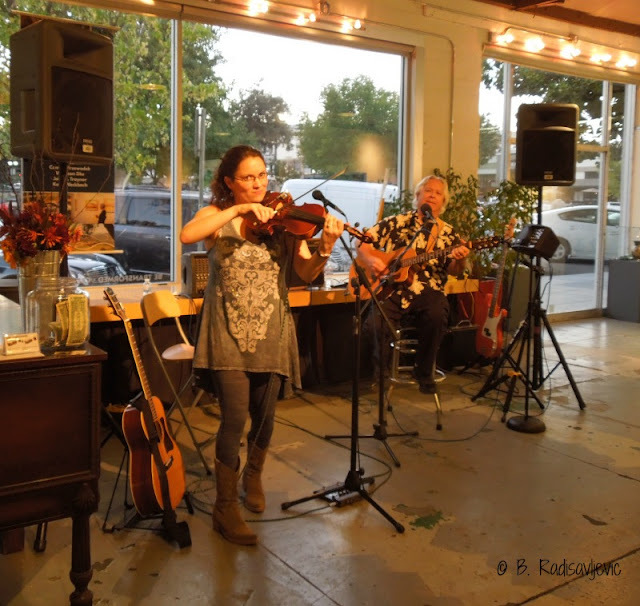 Every month at Art After Dark a different musician is featured. I took this photo at Art After Dark in October, 2016. I loved listening to Julie Beaver and Wally Barnick as they entertained us. I couldn't keep my toes from tapping. See what other City Daily Photo Bloggers have posted to this theme.